Woo, that's a lot to cover! Ha! I get variations on all these questions every year after my House Tour, though, so since I'm feeling chatty, how 'bout I tackle some? I'll even sprinkle in photos from around the house to keep it interesting. I admit it: I love clutter. I love surrounding myself with STUFF. 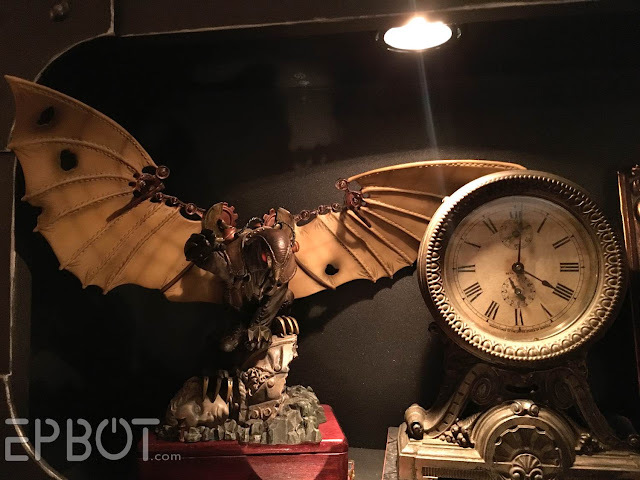 I like the hominess and warmth of personal collections, and I like having areas filled with treasures for people to discover as they roam the house. I also love antiquing. YEAH I SAID IT. 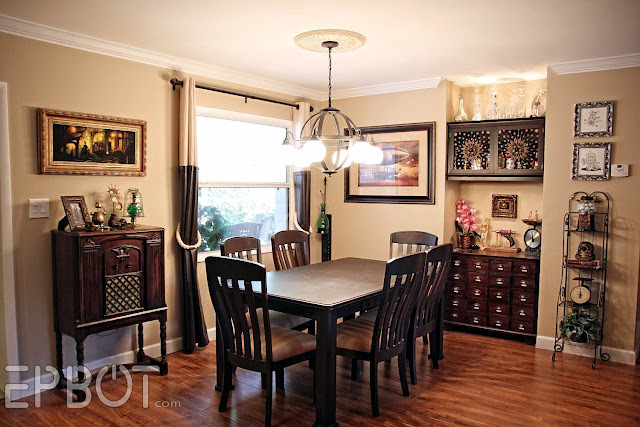 - Start by putting everything you want to display on the dining room table. Yes, everything! You need to see what you've got to work with. 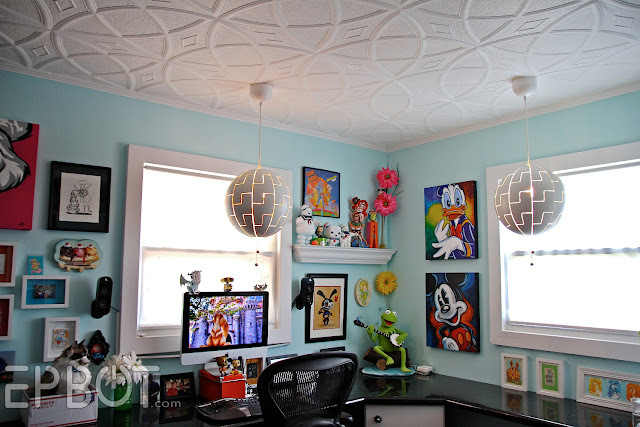 Then clear off all the surfaces you want to decorate, so you can start with a blank slate. I do this every year for Christmas decorations. Packing my everyday decor away for 4-6 weeks helps me see it with fresh eyes again come January. - Work in vignettes. Don't tackle the whole room at once; start with a table top. A mantle. A book shelf. Select one or two "big" things from your cache on the table - things you really love and want to display- then build up around them with smaller, more generic items (candles, plants, etc). - Odd numbers are key. Always group things in 3s and 5s. Don't ask me why, it just looks better. See how the seahorse is tall and thin, and the stack of books with the flower is short & squat? Then the small clock in the middle rounds them off to an odd group of three. 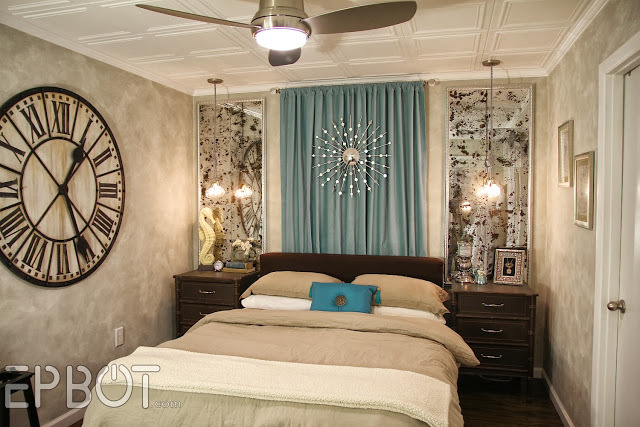 This is our bedroom makeover from a few years ago. I think you can tell I'm a fan of symmetry. - Take a picture. This is my favorite trick, since the camera always sees what I can't. Stuck? Not sure if it looks right? Whip out your phone and snap a pic. You'll instantly see what needs to change, if anything. - Have a permanent "donation bag." Mine's in my closet. I fill it about twice a month with a mix of clothing and housewares. Having one always started makes it easy to toss something the second I realize I don't need it anymore. Then we give everything to a Teen Charity thrift shop, so I feel like my stuff is still doing some good - which also makes it easier to let go. - Sentimental treasures you plan to display. So YES to Grandma's pretty doilies, NO to Grandma's ugly doilies. And since you can't appreciate what you can't see, do you really need ALL of them? How about just one or two to hang on the wall? This is a tool I could re-purpose and display, unlike, say, his old screwdrivers. And I don't need ALL his tools to remind me of my grandfather; just this one is enough to make me think of him each time I see it. Just something to consider. Oh, and that antique pocket watch was a gift to John from my dad. Do I really display family heirlooms with Disney ornaments and video game toys? HECK YEAH I DO. ...next to a pretty antique clock we picked up a few months ago. - Anything you love love LOVE, even if it's silly and you don't know exactly where to put it yet. If it makes your heart happy, that's enough. The rest we can figure out later. 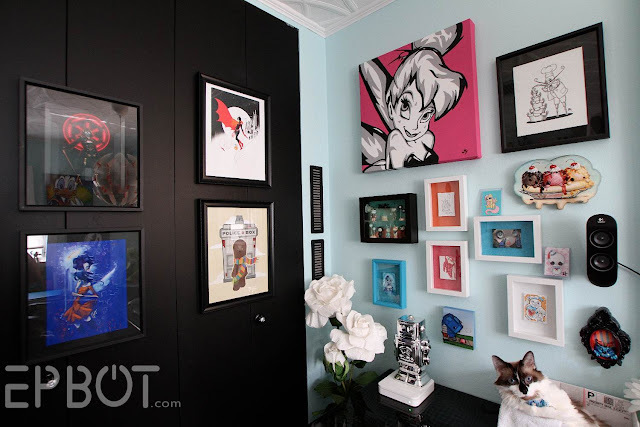 Still, I try to keep it art-centered, and I tie all the colors together with black and white frames and furnishings. - That thing you feel guilty looking at. I don't care what it is: unused craft supplies, a tacky wedding gift, fancy china you hate using, whatever. You haven't done anything with it yet, you're probably never going to... so cut the cord, dude! Someone else will love it, I promise. - The metric ton of sentimental stuff you'll never display. I covered this in "keep," but it bears repeating. Especially big stuff, like furniture. If you don't love it or need it, donate it! Focus on keeping little things you can easily display instead. - Stuff you like but don't love. Life's too short to keep stuff "just because." Sure, that vase is fine. Do you love it? Does it have a story? Is there anything more fun/interesting/personal you could put there instead? Your house is one big conversation starter. Do you want to talk about Bed Bath & Beyond? If not, then MAKE IT INTERESTING. Fighting clutter starts outside the home, you guys. It was a real turning point when I realized I could completely love an item, appreciate it exists, but not need it in my house. That is HUGE when it comes to geeky collectibles especially, lemme tell ya. - Choose your battles, choose your favorites. 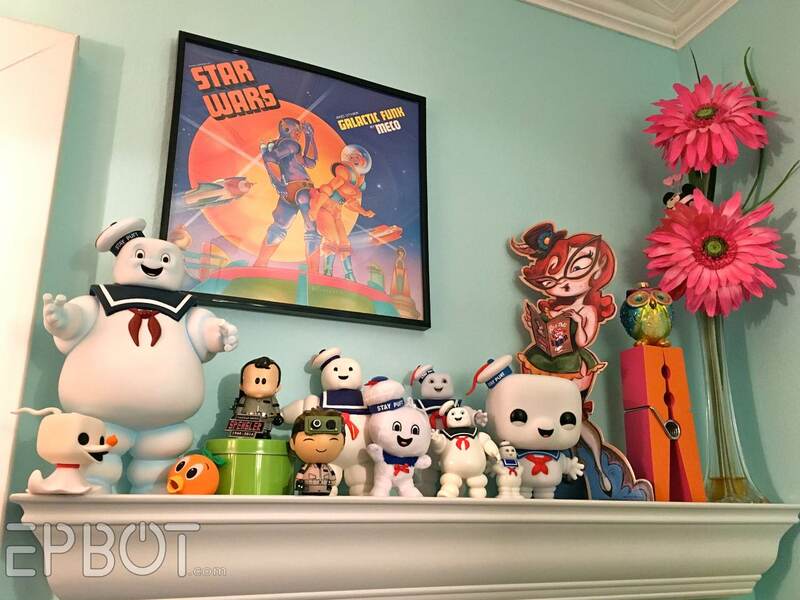 I have a few things I collect, but I don't buy everything with Stay Puft or a seahorse on it. Be picky. Think about your space. Play favorites. - Display what you love, not what "looks nice." Nothing gets me more riled than the belief that geeky stuff isn't "grown up" enough for the living room. GRRR. 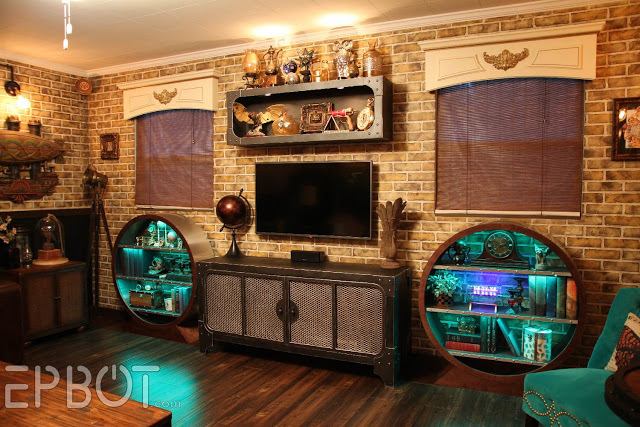 I beg you, fellow geeks, fly your geek flag in the living room. Put your Pops on the mantle. Hang a ray gun on the wall. 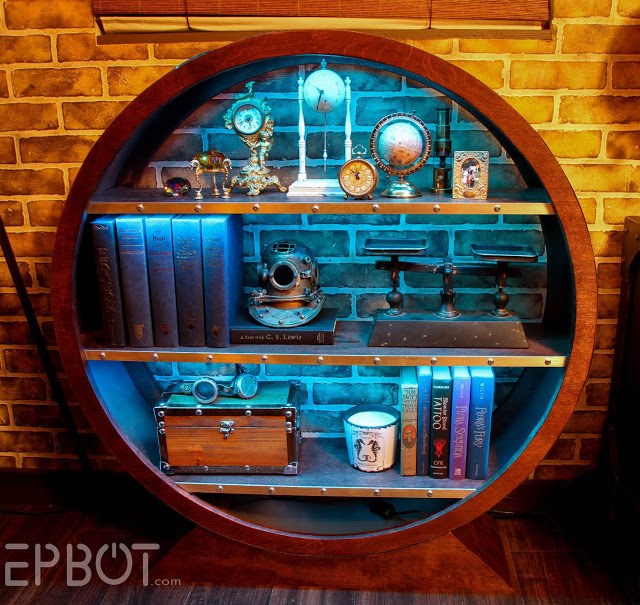 Get a light-up bookshelf for your action figures. Put your cosplay armor on a mannequin in the corner. Make it pretty. Show it off! It's your house, your space, and dang it, your space should make you happy. Not to mention all those things can look AMAZING and elegant and yes, "grown-up," if given the proper displays and design. This is the same shelf from before, de-Christmasfied. 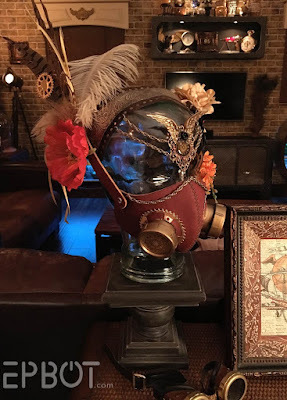 It is unabashedly steampunk and geeky and even a little silly (hellooo, DIY respirator mask! ), but presented in an elegant way. 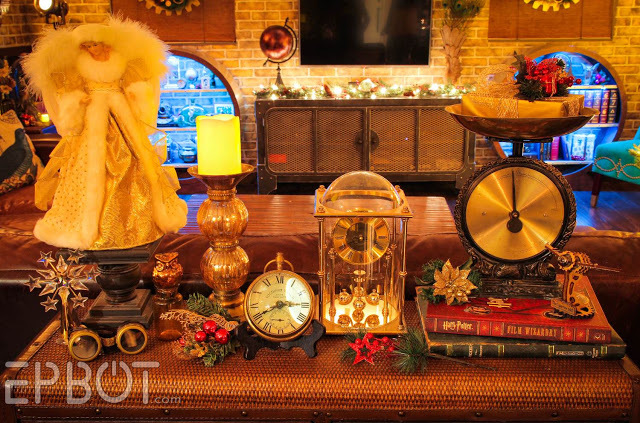 The trick is to use nice display stands and frames and one or two "generic" decor pieces (like the clock) to blend it all together. 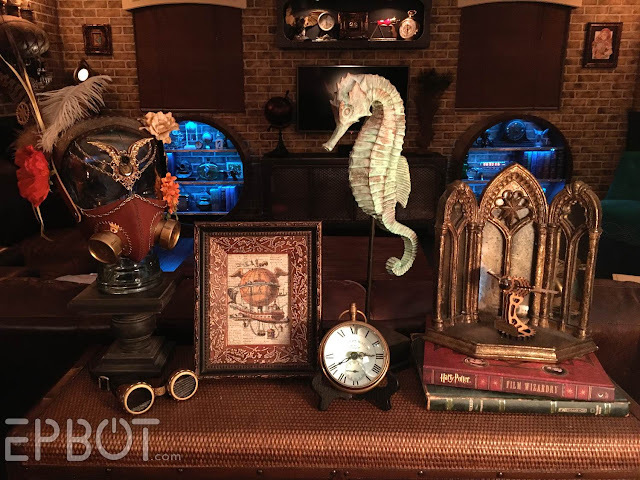 You can do this with a more modern vibe if you're not into steampunk, of course; the basic pieces are still the same (candlesticks, frames, shelving, etc.) Just go for, say, all white, or metal, and cleaner lines. Right, I think that's enough for now! Maybe some other time I'll tackle craft organization (only the power tools are in the garage, Jenny; the rest is all in here!) and maximizing small spaces - assuming you guys aren't bored to tears right now. I hope some of this helped, or at least inspired you to get more of your hobbies and interests out in the open! In fact, if you have something odd you don't know HOW to display, then please, tell me about it in the comments. I love a challenge. Thank you for writing this column. My husband asked if he could write one of your tips on a bracelet for me when I am considering certain items in a store: "It was a real turning point when I realized I could completely love an item, appreciate it exists, but not need it in my house." Perhaps, indeed, I should write that on something and keep it in my purse, in case I need encouragement while shopping. Also, that reminder could be nearby when I am decluttering. Keep up the amazing work you do with cakes, geekery, self-awareness, cheerleading, invention and design, and all the rest! I loved this post! Admittedly, nicely displayed arrangements aren't the highest priority in my house right now, because of the havoc-wreaking toddler and his minion in the making. And a kleptomaniac dog. And my husband isn't a fan of clutter anyway. But a girl can dream, right? Anyway, I was certainly not bored. And I'm actually in process of doing a big craft supply declutter right now, since we need the room for the baby minion. Since I'm moving from an entire room to a closet, I'll definitely be looking forward to both the small space and the craft supply posts! I second the request for how to keep your crafting organized! My question to you is how the heck to keep this all clean and dusted? I have a love for mid-century modern furniture, in large part because its clean lines make for quick and easy dusting. I keep everything streamlined and uncluttered because I don't want to spend one second more than necessary cleaning! My biggest issues with displaying things is a lack of surfaces to put stuff. I'm perfectly fine with flying my geek flag though! The centerpiece of my living room is a large pirate flag from an anime, & what little display space I have has a model of the pirate ship from the same anime, a dragon, & various other goodies set up. Almost all of my wall art is geek related in some way as well. "YES to Grandma's pretty doilies, NO to Grandma's ugly doilies." Thank you. Oh, thank you. The ugly ones - the yellow and white ones in the shapes of little dresses so they're *completely* useless - go out tomorrow. "...the yellow and white ones in the shapes of little dresses..."
Actually, those sound like they would be charming if you framed them a hung them on the wall! But only if she LOVES them. Thanks for the organizing tips! I am definitely struggling with clutter vs display, and this was very helpful. I recently realized that even though we've lived in our house for a year and a half, I have almost NOTHING hung on the walls! I keep waiting for the "perfect" things to put there, but really I think I'd rather just hang all the candid snapshots we've accumulated. Thanks for inspiring me to decorate with what feels like "us" rather than "grown up" items. Hi Jen! your display rules are also applicable to floristry, which is were I first heard them. Odd numbers and three shapes, tall and pointy, round and fluffy/feathery texture. These golden rules of proportion and arrangement can be seen in art and nature and apply to any visual that is pleasing. The variables of shiny,not shiny and colour harmonising and contrast are added depth to arrangements. Your suggestions about clutter and donation are also excellent. Here is another, if you cant remember you had it when you pick it up you should get rid of it, or if it hasnt been used this year it can go! This popped up right as I was looking at my shelves and saying to myself that I need to only keep the Monster High dolls that I love so that I have more room to display the ones left behind better. I only have a bit over 200 of them, time to knock that number down quite a bit. I do much the same (keep an empty box for unwanted items), except when it's full it goes to the local humane society thrift shop. Wonderful ideas here, especially that you don't have to have ALL THE STA-PUFT (or whatever thrills you). I have a huge collection of Disney memorabilia stuffed into a closet where it's not doing anyone any good. Time to let some go so I can display the ones I really love. Thank you for this! My problem is that for the last 10 years or so I've been anti clutter to the point of never buying anything or even keeping things that I love. My house is so bare is looks like we just moved in despite having lived here for years! Long story short, my late parents-in-law were hoarders of the extreme kind and having to clean out their house after they passed made me purge our own belongings and kept me from ever buying a knick-knack again. But I want to have THINGS again! I could actually live in your house, and you made me realize that having lots of things around me doesn't have be suffocating. I desperately want to get past that. I'm most curious about how you store the unused treasures. We have a small house too, and it's hard enough to find a place to store the winter clothes! Not Ms. Jen, but we have a small place, too. One of the places I use to store things are in decorative boxes similar to hat boxes. (Michael's generally has a ton of them this time of year.) Most have attached lids, but some lids are removable. I buy the ones that suit our decor and set them on top of the taller pieces like an antique wardrobe, the hutch of our desk, etc. I put small decor items, seasonal clothing like swim suits and hats and gloves, and other used-but-not-often items. I put little tags turned around backwards on them so I remember what is in each one. I use photo storage boxes for craft supplies. I like the idea of hiding something in plain site. the shelves and tables? I know that Lilly has her box in your office, but that's just one room. Does Tonks have a "special spot" somewhere? It also helps that both girls are "ground-dwellers," meaning they don't even LIKE high-up spaces. About the highest they'll try to get is the back of the couch. Which makes us very lucky, I know! Do you arrange the cats or do they naturally display themselves? :D I just loved how Tonks and Lily both seemed to "get" what was going on and just posed to go along with it...but then cats have that talent. Loved this post! These are excellent tips and very clearly explained. You guys are display champs! This is amazing and so helpful! We're in the middle of de-cluttering now and this is just what I needed. I'd like to know how to display books and board games when they're in a glass front cabinet and you don't have enough space to do the traditional decorating method of "1/3 books, 1/3 decoration, 1/3 space" That style looks beautiful in magazine mansions, but we have a teeny apartment, we NEED our books, and we sort of end up looking more "used bookshop" than "literary elegance". my hubby nearly killed me when I suggested this, but our glass-front cabinet books are arranged by color and they are beeeautiful! YES! Books are the worst. We homeschool so I cannot bear to part with books. Who knows when we might need that knowledge? Definitely rocking the used bookshop style here. Really time to purge. Ugh. Oooh, I could do a whole post just on books - they really are the hardest design challenge! To maximize space I've arranged them on our one wall-length bookshelf in Tetris-like blocks, but I won't lie; it doesn't look too pretty. Modern books are just so ugly, your best design option is to display the pretty ones, and either slip cover the rest (SO MUCH WORK) or hide them behind cabinets or curtains or art. I'm working on a solution for my own shelf - when/if I find it, I'll post some more ideas. This is how I tidy up. I wonder if I got this idea from you years ago? I should give decorating a go. I need to have my boyfriend read this. I trained myself out of hoarding when I was a teenager and now I'm trying to teach him. One method I use, especially with craft supplies, is to ask two questions. Are you going to use it in the next three months? Is it easily replaceable? It's amazing how much those two questions have helped us get rid of SO MUCH random leftover stuff!! I love this post! Thank you! I was definitely not bored and would love any tips and suggestions you have and want to share. Thanks again. I like this post, even though I'm in some ways the opposite. I use my wall space for bookshelves, and my bookshelves are full of books. I LIKE the used bookshop look. 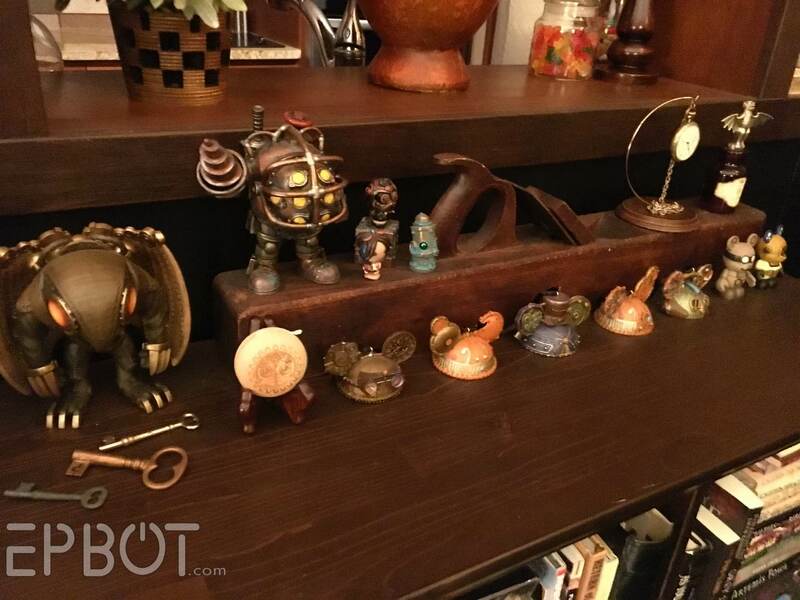 :) I do have some knick-knack type items in front of the books or on top, but not too many. I totally agree about putting out anything you love, though. I used to keep books that I thought were 'important' even if I didn't like them, and tried to make my fantasy collection look smaller by stacking them in front of each other. Now I swap or donate anything I don't want to read again, and the living room shelves are all fantasy/sci-fi, because there's more room out there. I ended up with a plastic dragon somehow, so I put it on the shelf next to "The Unexpected Dragon" by Mary Brown; makes me smile whenever I see it, even if no one else notices the joke. Thanks for the tips and photos. Plus we got bonus Tonks and Lily pics! That happens here, too, mostly with new purchases or half-finished craft projects. You might try to figure out what category of stuff ends up on the table most: mail, clothing, school supplies? Then make a space for that category somewhere else. For example, we have a tray by the front door for keys, sunglasses, & receipts. You could also just put a pretty basket ON the table for certain items, so if nothing else, it's easier to pick up and put away later! Perfect time of year for this post. I've learned to let things go, but it is hard sometimes. Thanks for the inspiration. Just a note for those of us not as talented as Jen: I have a friend who does interior design. The first time she came into my house, she said,"Well, its not Home Beautiful, but it feels so welcoming". I said," Then Ive done my job well!" LOL! Your house is one big conversation starter. Do you want to talk about Bed Bath & Beyond? If not, then MAKE IT INTERESTING. I so agree with this! Whenever a new person visits our house they tour it like it's a museum and I prefer it that way. When we went to Denver Comic Con last summer and bought about 10 or 12 prints of stuff from our fave fandoms, that was finally the push we needed to geekify our living room! My husband has some Star Wars stuff in his tiny home office, and I have a few Doctor Who and Harry Potter things in mine, but gosh darn it, we are adults, and we get to decide what that looks like! It hasn't quite happened yet, but we want to get rid of all or most of the generic "Asian" STUFF in our living room and get all our geeky stuff out where we can really feature it and enjoy it all the time! I like what you said about like vs. LOVE. I like lots of our stuff just fine, but... it's just... fine. I'd rather have the 2-foot-tall poster of Mad Max characters where I can gaze upon it all the time instead of a generic "flowers in a vase" print, and the bloodbag muzzle Max wore featured in a shadowbox instead of a slightly cute tea set. LET'S DO IT, YOU GUYS! Fly your geek flag proudly and all over your house!!! Perfect timing for this post! I've been in my current house for 3 years, but it's only just NOW that I've finally given in that we're renting this place for a while and should really start to fill it properly. We moved from an apartment into a 3 bedroom townhouse and we still don't have the furniture or storage items to utilize it efficiently. Now that we're starting to collect more decor, I was lost on how to display it all and where. This post definitely helps! Now to figure out shelves/tables to display things on! This was very helpful, thank you!! Not boring at all. Awesome post! Thanks for sharing all your tips. I'm constantly fighting the battle with myself to let my geek flag fly even in the main living spaces. All my geek toys don't HAVE to be relegated to the study. My goal for January is to purge/declutter two things per day. It's pretty easy to do two things at a time, not overwhelming at all. Another "purging question" that I read that I found helpful is: if I ever need this again, could I replace it within 20 minutes for $20 or less? If the answer is yes, toss it! Such a great (and timely) post, Jen. Thank you! I need to go through the boxes of things from my parents' house that I wasn't ready to part with in the estate sale and start pitching. You are so inspiring! 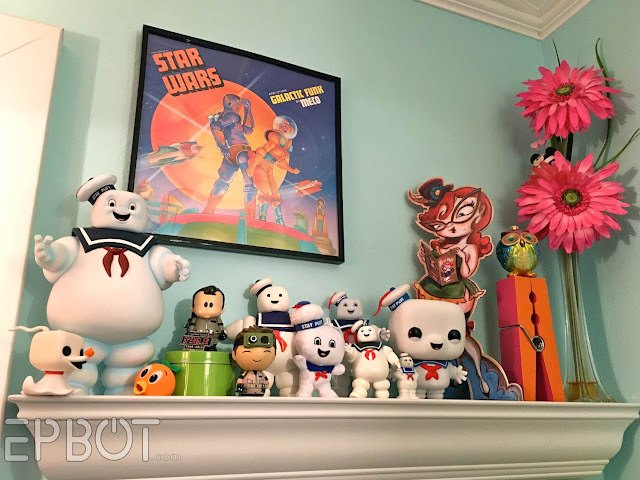 I'd love to display more of my geeky stuff and this post gave me that extra nudge. This part: "It was a real turning point when I realized I could completely love an item, appreciate it exists, but not need it in my house. That is HUGE when it comes to geeky collectibles especially, lemme tell ya." YES. I grew up really poor and didn't have any disposable income until after I'd gotten married, and I bought ALL THE STUFF just because I finally could. Then the economy turned and we didn't have nearly as much disposable income, and now I actually catch myself at the store saying, "I don't NEED this" after admiring something, and regretting the money I wasted on a bunch of stuff I don't want/have use for anymore. 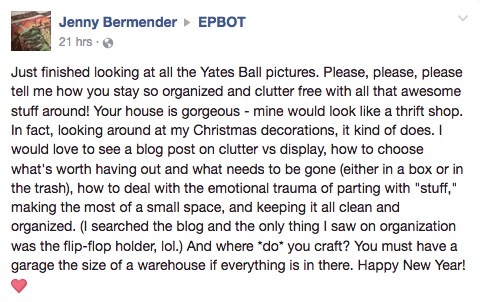 First, your house is amazing and I loved this whole post and can't wait to see the one on craft organizing. Soon. Pretty please. Oooh, what a great piece! And Kimstu beat me to it: I'd do exactly what she said, removing most of the shelves and turning it into a display for collection of small treasures. I'd also mount it on the wall (Make sure it's in studs for extra strength) to further maximize your space. Love this post! I always say thrifting is a sport for me and I have to be careful about it. We slightly downsized with our move to a farm, but not a ton, I already had lots of fun things. I think the funniest thing about the move is, I've never really put a bunch of nails in the wall before this house, but something about having paneling made it easier? Like the smoothness of the plain walls in our house before made me not put things up. Anywho, your house has been inspiration for decorating for a good bit now! I'm happier with my collections on the walls than I was with them waiting for a home in our home. I love that you put everyday decor up when you put holiday decor out, I've done this for years and it's made taking the holiday decor down much more fun. I don't feel like the house has lost it's sparkle, because I get to re-decorate afterwards with things I already love. Thanks for the tips Jen! I love the part about a house being "one big conversation starter," I will be using that rule of thumb as I Spring clean this year. I have a decently sized collection of sparkly colorful rocks and minerals, but I can't figure out how to display them. At one point I bought a few shadow boxes, but I wasn't able to make it work. I can't figure out how to display them in an interesting way. Any idea I've come up with just ends up looking like a pile of rocks. I do have one of those antique printer's tray, but most of the openings are too small. One of these days I'll find an idea that works. How about in clear glass vases and/or bowls? I have some blown-glass flowers in a big clear vase with the stems stuck into a mix of stone and wooden "pebbles", but sparkly colorful rocks would look nice in a glass vase all on their own. I also have some pretty rocks and shells tucked into decorative boxes on shelves and such. So they're not immediately visible, but when somebody's poking round on the shelf and opens the box (which is usually left slightly open so they won't feel like they're being nosy), then surprise! Pretty rock! Not Jen, but I used to display my collection of smaller sparkly rocks and minerals in a footed crystal candy dish. If the pieces are larger, I'd maybe pick one big one and then surround it by a scattering of some of the smaller ones on something like a doily or some other neutral background round mat to draw attention but at the same time delineate a display space for them. Right now the only one I have out is a large volcanic quartz geode, which is sitting next to my fireplace. Looks like you've already got some great ideas to work with, Trish, but I'd add that, for the larger rocks, you could use one of those tiered spice rack stands (or make your own custom size like I did for this Pop display.) That way they're still pick-up-able and not locked behind glass. That's a great idea Jen, thanks! Thank you for this post! I've been struggling with how to do this my whole life. We're probably moving fairly soon, and I wanted to start fresh in the new house. I've said it before and it hasn't happened, but I'll try out your method and maybe this time it will. My first thought is to get better frames. Even if they're just inexpensive wooden ones that match. And if you have anything you want to keep nice for a long time it might be worth UV-resistant glass (a of places can cut them to order for you). Goes a long way as a step up from the super-cheap college-style poster frames. Better frames for sure, or for a cheaper option (and assuming you're OK doing something permanent to them) John & I've glued posters to Masonite and built up the sides, like this. (Sorry, it'd hard to describe.) Makes the poster look more like a mounted painting! I'd like to this with foamboard some day, too, since I'm *pretty* sure it would work fine, and be much easier and cheaper to do than the wood version. What a great posting! Thanks for sharing. The "like but not love" really hits home with me and the family "heirlooms." I feel so handcuffed by those! You are giving me courage to let go. I loved this post! Thanks for sharing about the process. I have the exact same plane from my grandfather and I never know where to put it so it randomly travels around the house every few months. Using it to help display other things is great! Thanks, Jen! This was such a perfect post, especially as I've started doing craft swaps on Instagram and want to display my geeky stuff somewhere. Some will go into my "office" (craft space), which was an idea inspired by you, when I got The Beatles Yellow Submarine Lego kit for Christmas. Once I put my Christmas stuff away, I'll start with a clean slate and do some decorating. Thanks, Jen! It's funny you mention putting everything on the dining table first -- that's just what I had decided to do tonight -- before I read your article! 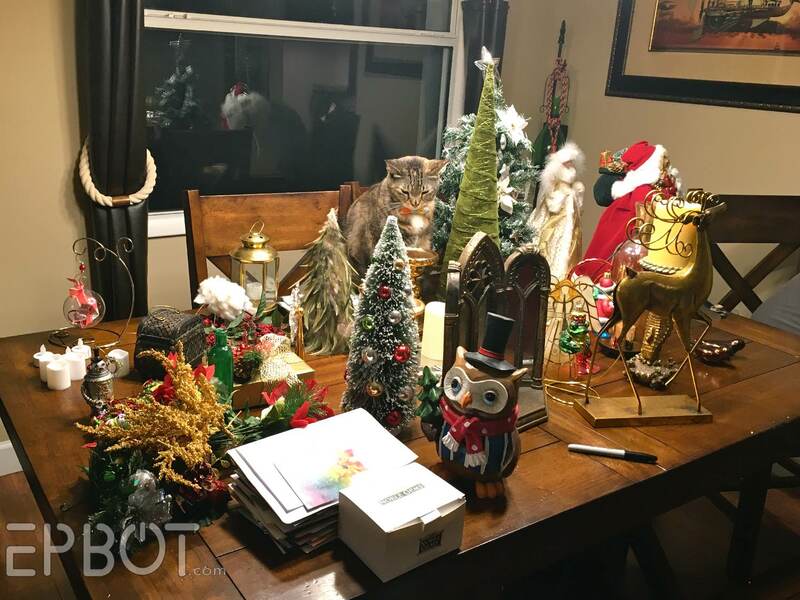 I too take down a lot of my regular decorations (country, lodge, rustic style) at Halloween, and box them up and relegate them to a back bedroom, then decorate for the holidays. For the past year I've had a remodel done of part of my home so everything remained in boxes. I started to unpack some of it this weekend and found that I'd even forgotten some of my more recent pieces, so it was a nice surprise when I saw them. My biggest problem (and life's not bad if this is my problem!) is that I cannot get friends and family to stop giving me things to decorate my home with! I don't mean to sound snotty or ungrateful. It's just that people see what you like or collect then give you MORE. I'm to the point where the MORE is not making me happy and I also want to be able to choose my own decorations. I can't bear to toss or re-gift things people have carefully chosen for me, so I put the gifts out. Then, people see them, and think that's what I like, and give me even more. And yes, I have tried communicating this to people. I have set up wishlists of things I really DO want (Digital books or movies people! I don't have to store them!) or told people that I have too much and really don't want more. I think my solution is going to have to either be a purge (oh the gift guilt!) or boxing things up and cycling them in and out once in awhile. I love people's generosity, but I feel like a dog that got fed too many treats and is lying belly-up on the living room floor in a torpor. @Jodi, don't tell your family and friends I said this, but what you need is to get "clumsier" and start "breaking" more stuff. If you've had a gift on display for a few years, and the person who gave it to you has seen it displayed at least once so they know you appreciate it, then you have permission from the Clutter Gods to have an "accident" where the item gets fatally "damaged". Just donate the "broken" item far far away where the original giver isn't going to see it, and enjoy the extra space guilt-free. Sometimes you can turn a not-really-wanted item into a more desirable one by having an "accident" occur just to a specific part of the item. A friend once gave me a handcrafted object that I really liked except for a decorative detail that I considered ugly. Whoopsie, a few months later the decorative detail got "accidentally" destroyed and replaced with one that I liked much better, and my friend is flattered that I liked her gift enough to "repair" it after the "accident"! I was thinking how much it helps to have a sort of permanent space of your own. I collected some things while we were renting, but it wasn't until recently (we've owned for 2.5 yrs now) that I felt like my decor was finally coming together. The modern IKEA stuff we had didn't fit our 1920's house particularly well (had to switch from greyscale to warm neutrals as my base color scheme, happily that worked with teal and green). And then there wasn't much point in trying to pick up furniture for the space until we really knew how we wanted to use it (particularly working around a baby grand piano... in the dining room!). But now that we're settled in and have the basic functional furniture figured out, and bonus storage furniture too, it's much easier to think about art and vignettes, and see where I want to fill in gaps or (gasp) pick up seasonal decor. I absolutely LOVED this post! I really need to figure out a way to favorite it so I can keep coming back to it! I've been struggling for the past three years with what to do with my mom's collection of dolls after she passed. She really wanted me to have them, but I have no interest. After reading this, I'm getting much, much closer to the point of letting them go and being able to donate them to one of the thrift stores back home. With collections of specific things, sometimes it can be worth the trouble to find the things' "community" and sell/donate them there. You send something you just can't love on to people who will treasure it and love it. When my dad died we found a model railroad club to give his stuff to, and MAN were they happy! A couple of pieces we were able to sell for far more than I imagined we could get for them, to guys who REALLY appreciated them. Win win. Jen, thank you. My boyfriend and I just bought a house, so we're not only mixing His Stuff and Her Stuff, we have the added challenge of 56 Years Of My Parents' Attic Stuff. I'm tackling that one box at a time, and while there's generally a pretty easy "hell no" phase, I do have problems with discovering things from my childhood that I haven't thought of in years. Any suggestions on THOSE items? i have a small space and adore these tips / photos. not boring at all! WHAT EVER HAPPENED TO STEAMPUNK SATURDAYS? Oh, I did love my Saturday Steams! The fact that you're the first to ask is probably your answer right there, though; steampunk still has an enduring fan base, but it's just not as interesting to *everyone* anymore. Which means less new material to feature, and less people excited to read them. I think I'll always love the style, though, so my own creations/decor/costumes will still pop up here from time to time! I'm a part of a Facebook group called "Steampunk Tendencies". 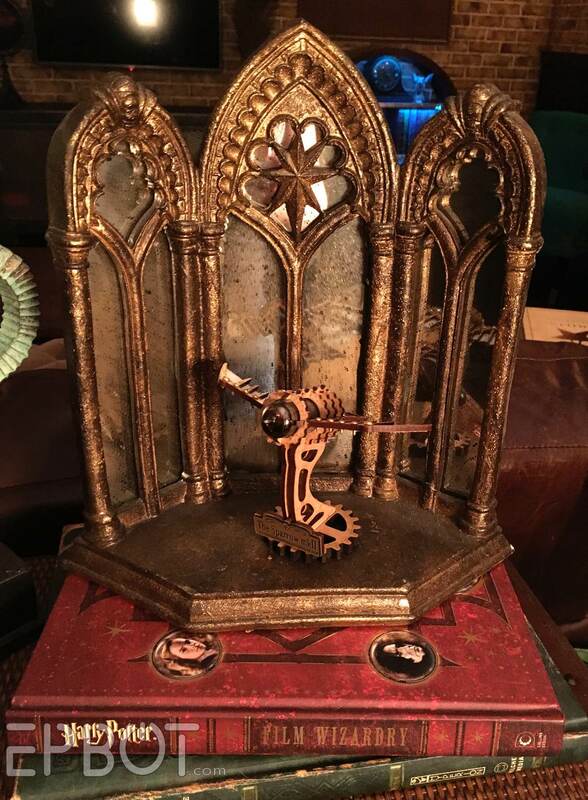 A lot of the members make or wear "steampunky" things (or both) and they are just beautiful! Speaking of Grandma's pretty doilies-- I actually have some and am completely stumped as to how to display them. I completely admire your decor style and think I could happily decorate in a similar way (though I don't have nearly as much (or any?!) steampunk goodness). You can frame them, either as a group, or individually. The backgrounds, mats, and frames you use can match the rest of your decor to bring it all together. You could also use the doilies as photo mats themselves, placing small photos in the centre -- or several photos, if the doily is large enough. You could stiffen them into shapes, to use as "covers" for bulb ornaments, or ornaments on their own [hot air balloons come to mind], or to make something like a lampshade. Or, you know, use them as actual doilies under your regular knickknacks ;-) [I recently made myself a snowflake doily to use under my new snowman-shaped cookie jar so it wouldn't scratch up my wood table, so it "fits" with my winter decor]. I know doilies aren't to everyone's taste, but for a steampunk look I think they could fit since they're very Victorian-feeling [assuming the genre of steampunk you're into isn't too cyber] -- I might even dye them [probably with tea] to fit more with the softer steampunk colors. I really do think they could work. Hmm I hadn't thought of changing the shape! That's a cool idea to consider. My mom tatted quite a bit, so I've seen a lot of traditionally framed doilies and use some of them under items on display, but I love this fresh idea. Thanks! Not boring at all! I love posts on organization; I've recently moved into a good-sized apartment for the first time in my life, and I thought your tips (and just seeing how you do things) were really useful. Please do write more, if you feel like it! 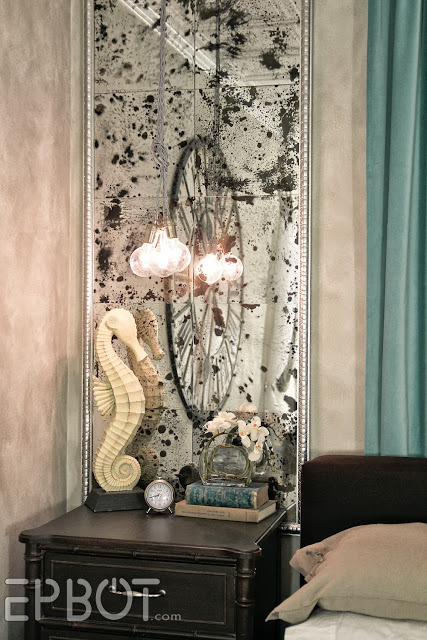 Love the triptych mirror! Is that a crafted item or something from HP? It looks the backing of the pensieve, so pretty! Happy New Year! I'm In Love With A Chicken.